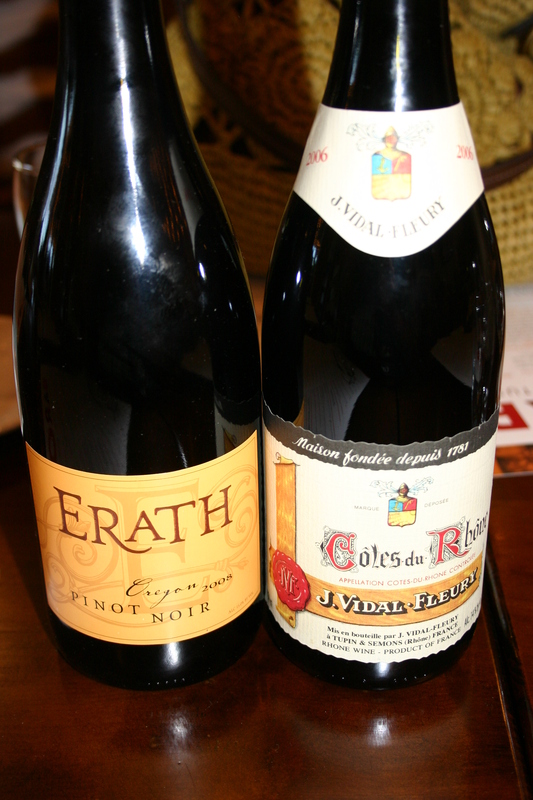 This entry was posted on July 11, 2010 at 9:27 pm and is filed under Barone Tuscan Grill, BYOB Restaurant Reviews, South Jersey BYOB Reviews with tags 2006 J Vidal Flury Cotes du Rhone, 2008 Erath Pinot Noir, 2008 Falesco Vitiano, Australia, Barone Tuscan Grill, Great Barrier Reef, JB Liquors, Swedesboro NJ, Villa Barone, Woolwich NJ. You can follow any responses to this entry through the RSS 2.0 feed. You can leave a response, or trackback from your own site. I was wondering if your new restaurant in Woolwich can host privte parties of about 35 people ? Does this location have a privte area for a birthday party? My family ate at the new Barone’s in Woolwich Twp. My wife and I with our two small children = $83 check. I had the gnocchi, wife had a chicken dish, a child personal pizza, and a child ravioli with 2 meatballs, and 4 iced teas. The highlight was how professional our waitress was. High price and it took 2 hrs once we sat down. We won’t be going back. Every neighbor that has gone here has said the same thing – long wait and very expensive for italian food. 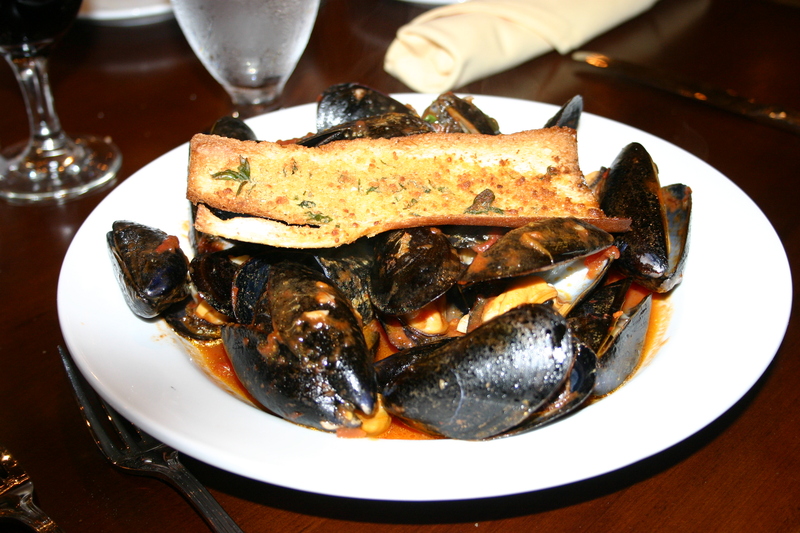 We took friends out for dinner to Barone’s in Woolwrich Twp. The food was excellent the service was not bad even with two waiters and watriess calling out. The food was hot and exactly as ordered. No childs menu was available ut they did offer a childs pizza (big enough for 2 adute), chicken fingers an a pasta dish. Litte know as it just started. 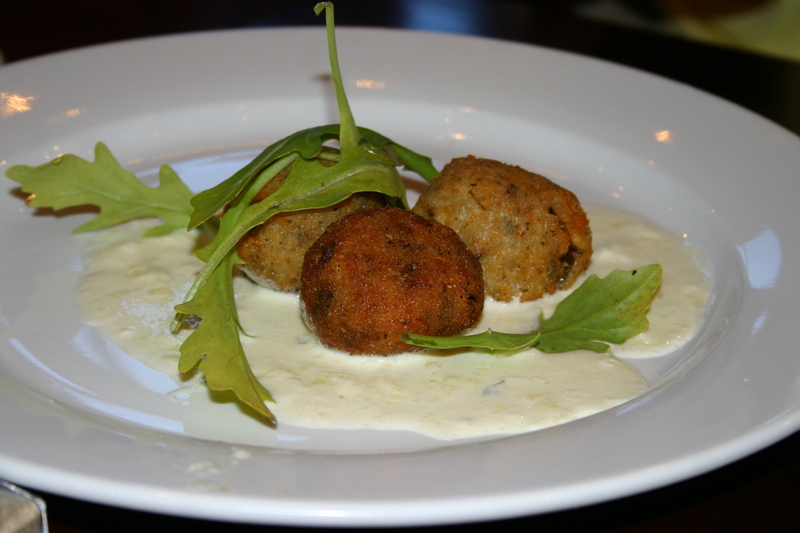 Between 3pm and 6pm there is a special deal – $14.99 for three courses. 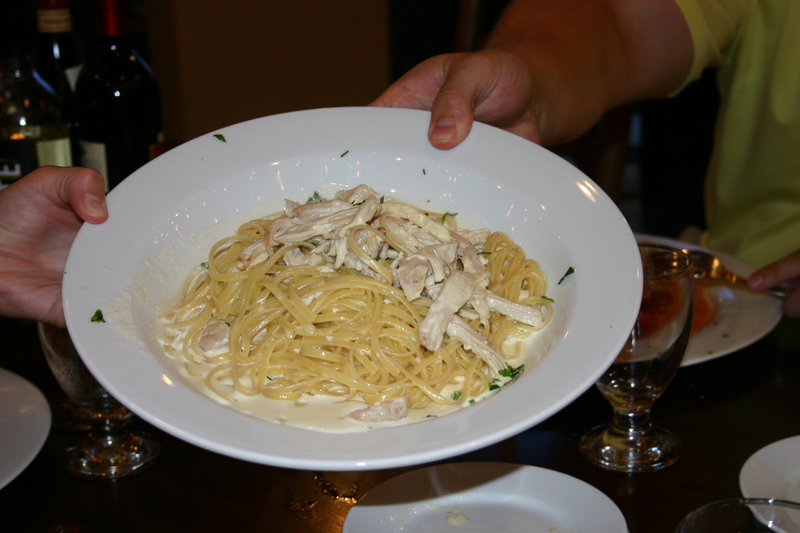 Soup, salad and main course (choice of Chicken, Baked dish or Pasta dish). These choices are right off the menue an one you want not limited to only a couple of dishes. Recommend it highly to try it – you’ll like it. It’s been several months since I ate there and did my first review. A couple folks in our party were very disappointed. I thought that in light of them just recently opening that things weren’t too bad. I am really anxious to get back for another visit. 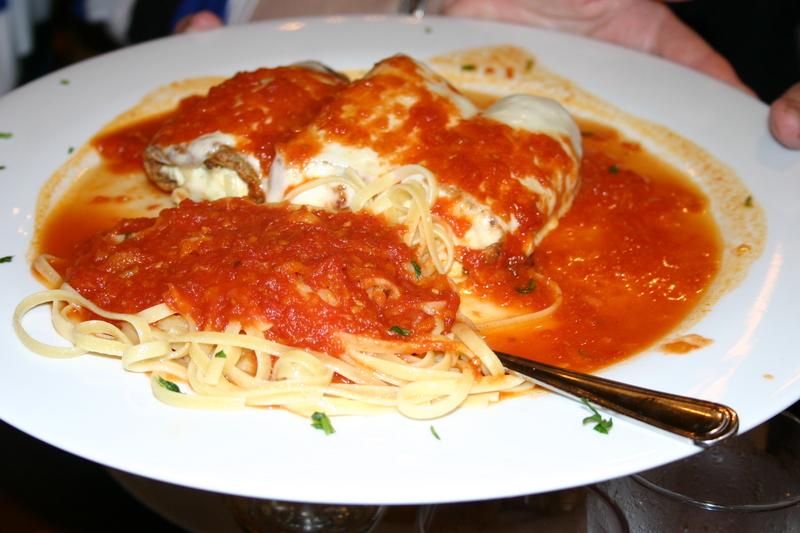 I have reviewd over 100 different restaurants on my blog but NONE have been read by visitors more than this Barone’s in Woolwich Twp. My gut feeling is that if you had money and could cook well you could open a restaurant in this area and make a fortune. People are starved “no pun intended” for a super-quality BYOB in this area. Do not bring children to this restaurant. They do not have a kids menu, but proceed to inform you that the children can order, spaghetti, pizza or chicken fingers. I had three children with me,two ordered spaghetti and one ordered pizza. They all ordered soda, guess what the price was for the kids. $8.00 for the kids meal and $2.00 for the soda. I never thought to ask the price, I was so disgusted when the bill came. Not to mention that we were not allowed to order pizza on the dining side, so we were forced to order a full meal that was disgusting. 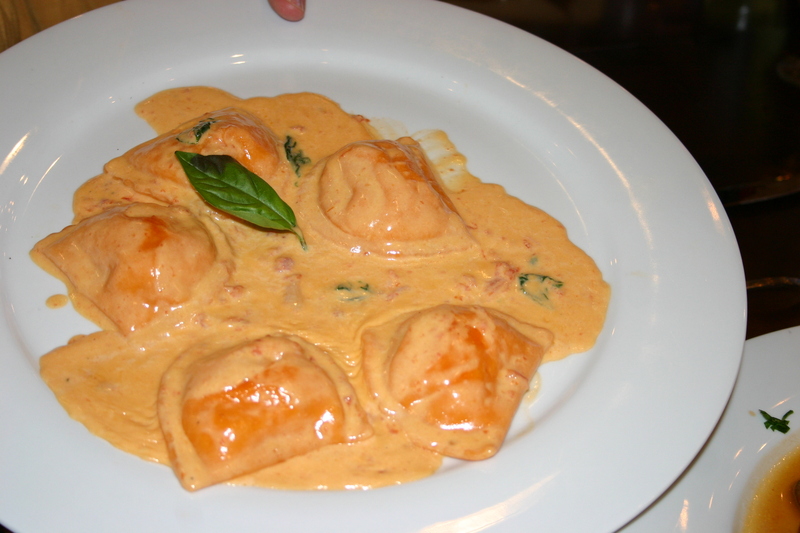 I ordered the shrimp ravioli with Alfredo sauce. The meal cost $18.00 and they put a total of 3 shrimp on the plate. 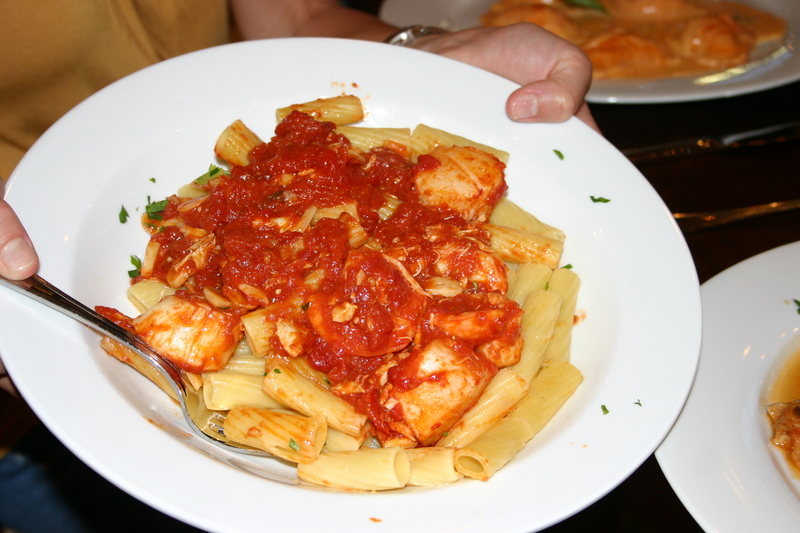 The sauce was so fishy tasting that I could not eat the pasta. This is not a kid friendly place. It is way over priced and the quality of the food is terrible. I will never recommend this place to anyone. I also used a coupon that I printed off the internet and was given a hard time about that as well. I’m with you Annette. This place is closing soon. We live very close and a friend told us they aren’t paying their employess so they keep losing their help. They probably end up paying them, but not before they leave. I’ve also heard that the family that runs these two restaurants are incredibly pompous. I saw the owner the night we were there and I can see what they mean. Terrible, terrible restaurant! I wish I could send this to more people to avaid the disappointment and waste of money. I’m going to allow your comments to stay posted but I have to allow for the possibility that these posts come from a few people who have some personal grudge with management. It seems to me that if no one got paid the place would not be open and doing what looks to me, like a pretty good business night after night. 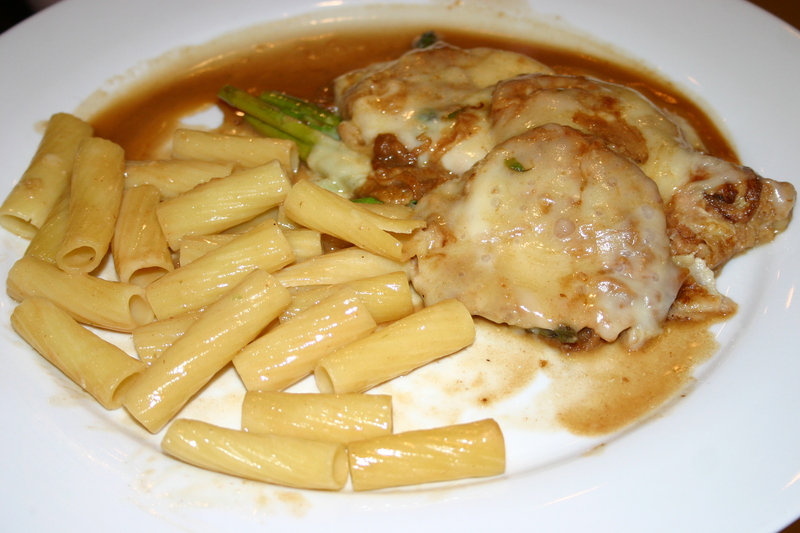 Again, based on 2 visits, Barone’s is, at least, a decent spot for a meal in Woolwich Twp. First time there tonight and I have to say it was excellent. Thanks for the review – my partner wants to check this place out soon as it’s so close to home but I’m rather picky with my Italian food – it’s got to be better than I can make at home or why bother, and most of the places around here don’t pass that test. Good to have some idea what to expect. I have to say the appetizers look pretty tempting from your photos, at least. Do entrees only come with pasta sides or are vegetable sides available as well? Follow-up to my earlier comment – we went tonight and I found the experience quite disappointing. 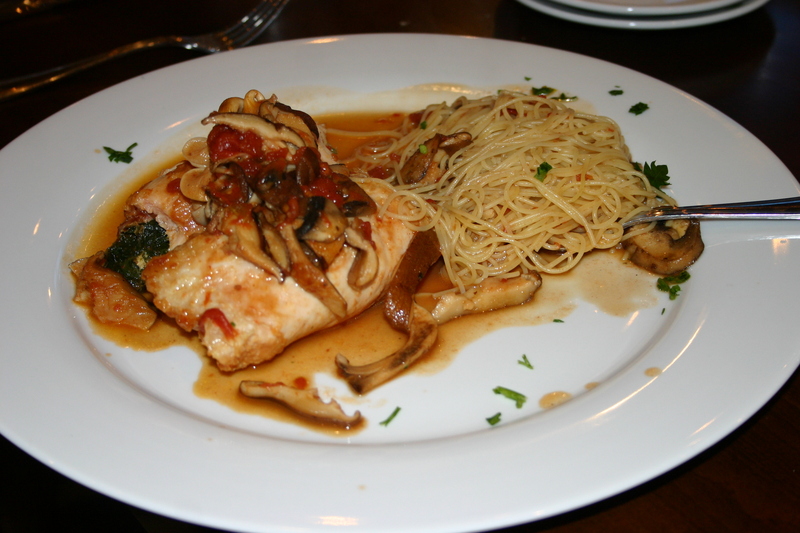 The food was “ok”, nothing outstanding for Italian food in South Jersey, but the poor service our group of three encountered really soured the experience for me. I’ll be writing up my own review shortly but I honestly doubt I’ll be rushing back any time soon given how aggravated our server made me. Other tables seemed to be fairing better with other servers, but still, bad service just turns me off a place like nothing else. Sorry to hear your visit to Barone’s was less than satisfactory. It is becoming very apparent that the area around Woolwich Twp. is in deperate need of eating places. On 12/30/10 we ordered pizza to go at 5:40 pm, from the Woolwich Twp. location. I arrived at 6 pm to pick it up, paid, and waited. And waited, as was another woman attempting to purchase food to go who was there ahead of me. There were at least a half dozen men in dress shirts, “manager-types”, unfortunately none of them have a clue as to how to run a restaurant. I saw 2 pizzas go on top of the pizza oven, but didn’t pay any attention to it since I had paid, gave my name, and assumed that they would give me my pizza when it was ready. The other woman’s take out dinners were ready and getting cold, but she was waiting for pizza also. None of the “manager-wannabes” knew what was going on. Finally, at 6:20 pm I stood up and asked one of them who those 2 pizzas on top of the oven were for. Well what do you know??? They were mine. “Manager-wannabe” that took my money ($37.00, ridiculous) never asked wannabe #2 who those pizzas were for when he took them from the guy making them and put them on top of the oven. I rolled my eyes, told him I had been sitting there waiting, grabbed my pizza and left. Dinners are over priced as well. 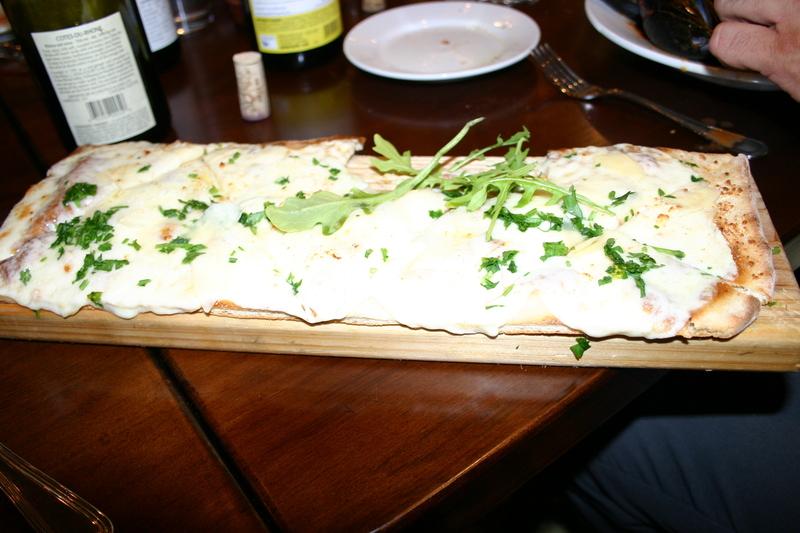 Do yourself a favor and go to one of the dozen other Italian restaurants in the area. We have not been back since. Just had take out…the food sucked!! The place has gone from ok to lousy!! Why are they still open? I could have pounded nails into concrete with the rolls. No Italian restaurant has anything to worry about. 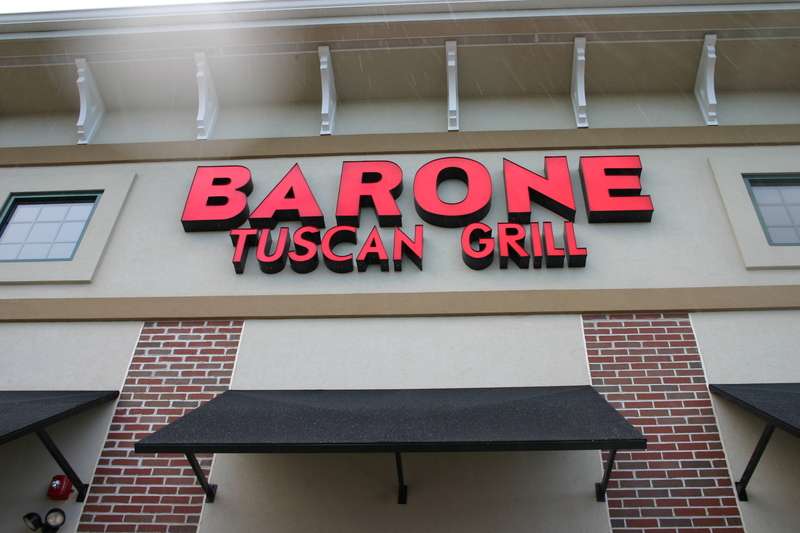 Update: The Woolwich Township location of Barone’s Tuscan Grill has closed. From talking to a former co-worker (I worked at Barone’s for over eight months), the restaurant’s been bought by Toscana. While it is sad to see a local business shut down, I am glad to see this restaurant close. I’m not just holding a grudge because they still owe me $200 in paychecks (which I’ll obviously never receive). The restaurant was poorly managed and maintained to the point where I believe the customers’ health was put at risk. There were a few instances where the hot water shut off; I’m not sure whether this was because of a mechanical error or someone being behind in bill payments. Either way, when the hot water shut off the restaurant remained open for the night. Anyone who would keep a restaurant open without hot water does not deserve to own a restaurant. When I asked the manager how the kitchen staff was going to wash dishes without hot water, he did not provide an answer. There is a lot more I could say about my time at Barone’s Tuscan Grill, but this is not the appropriate venue. I will probably wind up submitting an op-ed to a local newspaper detailing the experience and everything that went wrong in that restaurant. Overall, it was poorly managed and maintained, and it commonly felt like the owner did not put much effort into the restaurant to ensure it’s success. I hope that the restaurant that replaces Barone’s serves the Woolwich community much better; Woolwich deserves better for its customers and workers. My daughter purchaed a gift card for me in September–the restaurant closed shorly after. The owners must have know that they were closing their doors soon and for them to sell a gift card is FRAUD !!!! i enjoyed the dinners at this restaurant , which was the reason the gift card was purchased. I contacted the Moorestown Nj store, they tell me that all the restaurants are separately owned. He told me that he would try to find a resolve to my problem. 6-2-12, table 28/1 and server 431 Joe H. An absolute unacceptable dining experience. Three times asked for butter–order missing shrimp (forgot to tell us there was no shrimp left), received salad after the main course. All pasta mains and sides were cool, not hot. Eating utensils available for five of the six dinner party–had to get my own from another table. All the short comings had excuses and an apology was all too often used to blame other things other than our business.